The seasonal flavors of spring are a dramatic change from winter. We go from the rich, heavy flavors of meaty dishes simmered for hours to the bright, green flavors of vegetables often barely cooked. Spring food is refreshing because it is bright and light. To maintain a light dish, it's essential not to bury it in layers of butter and cream. This is where Greek yogurt is such a wonderful ingredient. It imparts tangy creaminess without adding a lot of calories and fat. 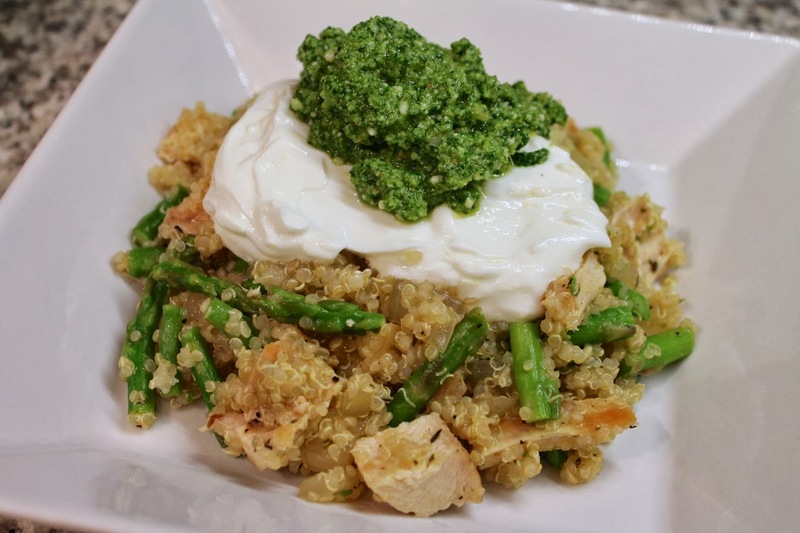 For this dish, I thought of a spring pasta with pesto, asparagus and chicken, but instead of pasta served it with protein-rich quinoa. Mint, a herb available year-round but that I feel is most at home during spring, gives the pesto bold flavor, and the dollop of Greek yogurt, when mixed into the dish, adds guilt-free richness. When using Greek yogurt in this manner, it's important to add it last, after the dish has been removed from the heat. You don't want to cook it, as it will separate and basically vanish, especially the nonfat variety. 1. Soak quinoa in water for 15 minutes. Drain and cook according to package directions. Set aside and keep warm. 2. Heat 2 tbsp. olive oil in a large frying pan or sauté pan. Pat chicken dry with paper towels and add to pan. Season with salt and pepper and cook until lightly browned and the chicken is no longer pink inside, about 10 minutes, turning halfway through. Remove chicken from pan and set aside to cool a bit then chop into 3/4-inch cubes. 3. Add the onion to the pan the chicken was cooked in (add additional olive oil if the pan drippings are less than a tablespoon or two). Cook over medium heat until the oven softens, about 5 minutes, then add the asparagus and garlic. Continue cooking, stirring occasionally, for another 5 minutes. Turn off the heat. Stir in the warm quinoa, cooked chicken and lemon juice. Taste and adjust seasoning. 4. Stir together the lemon zest and Greek yogurt in a small bowl. 5. To make the pesto: combine mint, parsley, hazelnuts, lemon juice, garlic and salt in a food processor. Pulse until finely chopped. Scrape down the sides of the bowl with a spatula. Replace the lid and turn the machine on. Using the feed tube, slowly stream in the olive oil until the mixture is emulsified. Transfer to a medium bowl and stir in the grated parmesan. 6. To serve, place about a cup and a half of the quinoa mixture in a shallow bowl. Top with a dollop of lemony Greek yogurt and a dollop of hazelnut-mint pesto. I liked this a lot. Is Greek yogurt your discovery of the year?